Please note our pool will be closed April 21 - May 1 2019. We apologize for the inconvenience. Discover the beauty of New Hampshire from our DoubleTree by Hilton Nashua hotel. 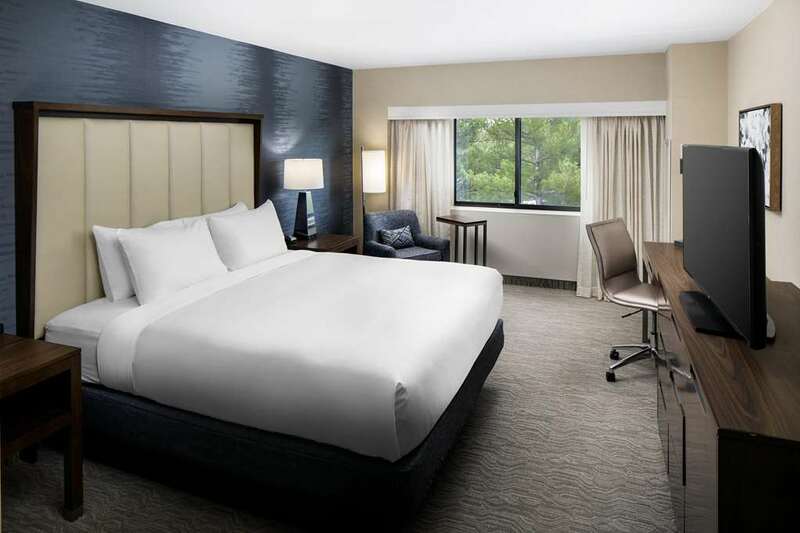 Tucked away off the Everett Turnpike our Nashua hotel offers a quiet retreat just minutes from the quaint tree-lined streets of historic downtown. We are also just 20 minutes from Manchester Airport. Take advantage of our complimentary shuttle for transportation to and from the airport as well as nearby popular attractions. Our exemplary service starts with a warm DoubleTree chocolate chip cookie at check-in. Settle into a guest room featuring a 49-inch HDTV mini-fridge coffeemaker and laptop-sized safe. Work at the desk with ergonomic chair and stay connected with complimentary WiFi. Upgrade to a suite for extra space and special amenities such as a bathrobe and slippers. Enjoy a warm bowl of chowder or juicy burger at Speakers Pub featuring lite fare as well as signature martinis wines and local brews. Speakers Corner Restaurant offers casual dining for breakfast lunch and dinner and room service is available daily 630am 1000pm. Start your day with a refreshing swim in our indoor pool or get an invigorating workout in our fitness center. Unwind with a trip to our spa or go for a stroll around the duck pond. Host your special event or conference in one of our 16 flexible event rooms. From an executive boardroom to a grand ballroom we can accommodate any event up to 450 guests. Our planning catering and A/V staff will help ensure your event is a success. Speaker*s Corner Bistro: Here at Speaker*s Corner we can fulfill whatever your food desires may be. Whether it be breakfast lunch or dinner either in Speaker*s Corner Bistro or in the pub both our front of the house and culinary staff await your arrival.